View: Website (the official switchfoot boards). 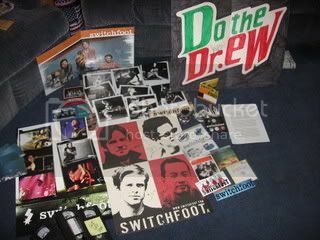 Okay Switchfoot fans. I've got a bunch of stuff I need to find a home for. First $40 gets it. 1 record- Songs- "Meant to Live" and "Monday Comes Around"
2 CD's- "Meant to Live introducing Swtichfoot video" and "CD Sampler The Beautiful Letdown"
1 burned CD from comp- 3 videos, "I Dare You to Move", "You Already Take Me There", "New Way to be Human". 1 homemade double sided poster created by Ren. "Do the Dr.ew" and "San Diego LOVE". 3 VHS tapes of recorded SF appearances-"Late Late Show", "Carson Daly 9/11/03", "TRL 4/5/04(I'm in it. 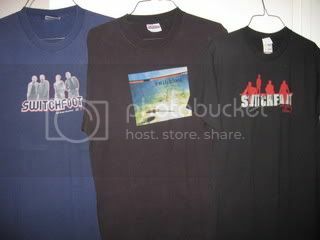 ), Pepsi Smash 6/17/04 and Late Show 9/29/04"
Switchfoot Story "Switchfoot-This is Your Life"
I, to this day, am still confused as to how I came upon this chatroom. I just thought I would share that with you. Someone came up with this really cool idea, I thought I would share it. Subject: Switchfoot Surfboard on eBay! Any questions, email me at dhs242@nyu.edu. Thanks. Vote for Switchfoot and your other favorite bands in the CCM music awards!! I also only started this journal recently, looking for friends on here so please feel free to add me! I signed up to do a promo project to pre-order Nothing is Sound. However, I am a bit confused about how to make my report. I'm sending out a mass email containing at least 50 people, but what do I put in my report? Sorry if this isn't the place for this. I just didn't know where else to ask. Thanks. Subject: new Switchfoot street team! Hey all, I found that if you pre-order Nothing Is Sound from Musichristian for $12.77, you get a limited edition that features the CD on one side and a 30 minute DVD on the other (which includes "making of" and live concert footage! ), as well as a free button and sticker! I just pre-ordered it and am excited about receiving it come September. Also, in the past I have preordered from them and received my CD like 3 days before release date! Hey! I just got back from the Switchfoot Bro-Am! Here's my report complete with pictures! Cross-posted in a heckuva lot of places. Okay if you are a myspacer or not you should click this link and check out a local artist here in Washington. His name is Benj and he t0tally pwns on the guitar, he is very talented.. he love's Jesus, music, surfing and of course some Switchfoot. So check out this cover he did on his six string of "Dare You To Move"
"Jonnyups: one of the best covers i've heard of switchfoot"
Comments: Read 11 orAdd Your Own. 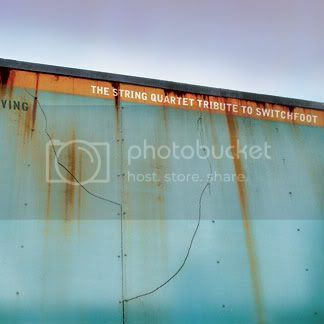 There is going to be a "String Quartet Tribute to Switchfoot" album being released March 8th. However, you can get this earlier through an internet pre-sale. You can hear some song clips of some of the songs like "Meant To Live" and "Dare You to Move." As a violin player and performance major myself, I think this is really exciting and awesome that Vitamin Records would make a Switchfoot Tribute album using all strings. Check it out!! Switchfoot’s nominations totaled five (two for song of the year and one for group of the year!) and frontman Jonathan Foreman added another three of his own. MercyMe better not win over them again. + i urdge you not to use the switchfoot sony message boards this next week. we're trying to avoid the current problems there and show split from sony. we want to leave and have our own boards again from switchfoot.com. pray for us, fast with us.. and make a difference.